Managing collective workload as well as your own can be a real challenge. How do you help people stay on the track and contribute towards the end goal without taking on too much? You are in the middle of your project development, but the work isn’t going so well. Tight deadlines and heavy workload are causing everybody’s temper to fray, and you can sense the heavy drop in your team’s productivity. You are surprised by the sudden change and you are asking yourself what went wrong. You are looking for a quick solution that will get your team back on the track and prevent any further project delays that may cost you an arm and a leg. But, whatever you do, you just seem to fall deeper into a tangled mess and even more behind the schedule. The truth is we’ve all more or less been there. We’ve all experienced a productivity crisis and we’ve all tried to come up with the most reasonable solution that would help our sinking ship to get back on the surface. The main reason why this happens lies in our inability to step back and view the core of the problem. Only when you get to the roots of the issue will you be able to treat it accordingly. Since people are the driving force of the entire system and the processes heavily depend on their performance, the lack of productivity is usually caused by human factor. Maybe your employees don't know how to balance the heavy workload and are constantly falling behind schedule. On the other hand, they may have bad organization skills or are simply too lazy and uninterested to contribute to the overall success. Once you identify the problem and redistribute your workload so that productivity doesn’t suffer, you are on the right path of creating a productive, healthy and balanced working environment. Here are a few things you can do to encourage productivity and strike balance between the workload and the time your employees spend managing tasks and handling their everyday challenges, using ActiveCollab. When managing multiple tasks, your employees tend to neglect the time they spend while jumping from one task to another. This can create confusion, drain a lot of your energy and time and slow down the progress. The easiest way to keep track of the time each employee spends on their tasks is to encourage them to make their own Time Estimates for each task. By simply entering the time, they will help you gain insight into the amount of time each employee believes it will take them to complete a certain task. If an employee fails to deliver the task within the desired timeframe, a manager enters the game. It is his job to talk over issues with an overworked employee and reach a resolve a problem in a way that it doesn’t derail anybody’s workflow. 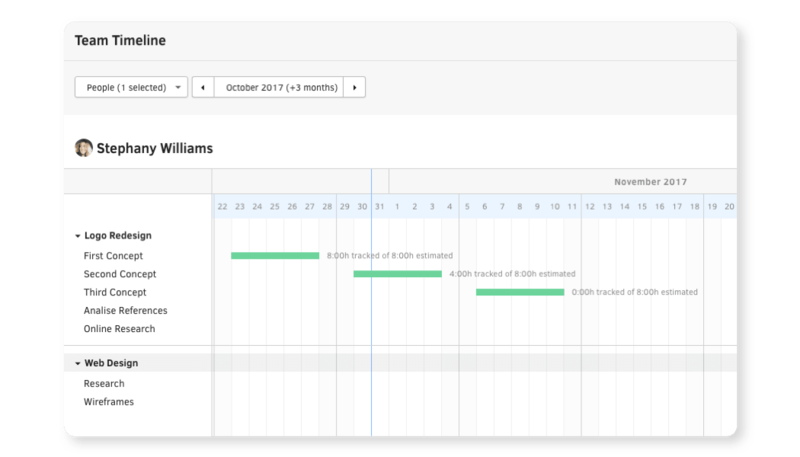 Once your team employees have created their time estimates and started tracking time spent on the tasks, you will be able to view their timelines in Team-Timeline Report and keep an eye on who does what. It lets you group tasks by an assignee and sees estimated vs tracked time for each task. If you want to see how accurate your team’ s estimates are, you can go to ActiveCollab Reports and view Estimated VS Tracked time. 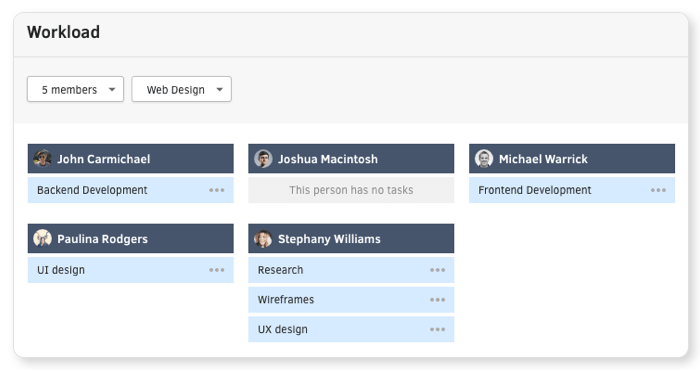 Go even further and filter results by person, project and task status. Who underestimated and who overestimated their abilities? What things went wrong? It will be much easier to see who is lagging behind when you can review everybody’s output. Take some time and discuss your employees’ work so that you can delegate the workload equally across the team and help your employees set realistic deadlines. This brings us to the workload management. If you feel that some of your employees are not as productive as they should be, maybe they have too many tasks on their hands. To see if there is a disbalance of workload between the members of the team, go to the Workload section. Workload Report enables you to see who is working on what and how much time has been spent on each task. On top of that, you can balance your employees’ workload and redistribute tasks by simply dragging and dropping. Helping your team overcome everyday obstacles and keep their productivity on a high level is a never-ending process that involves thousands of tiny decisions. Choosing the right project management tool that will help your team develop their productivity naturally and increase it along the way is, undoubtedly, one of the essentials.